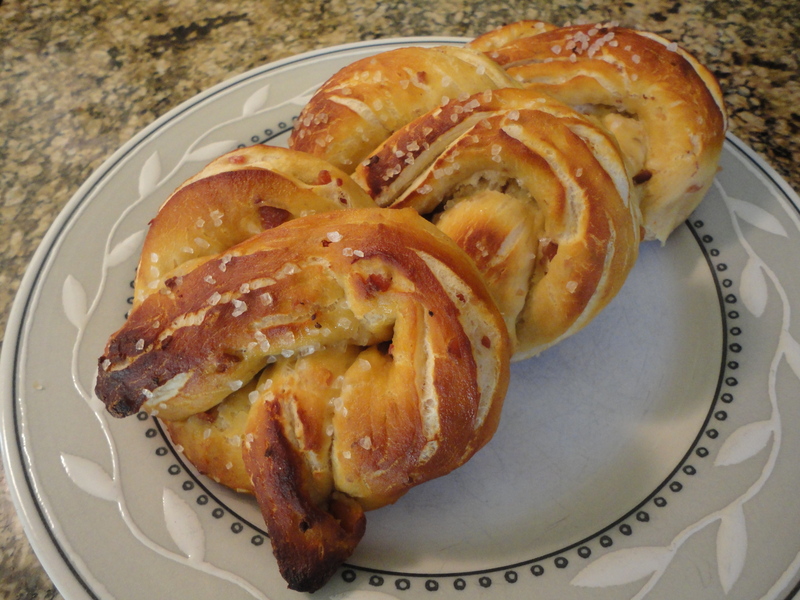 Bacon & Cheddar Pretzels w/ a hint of Sriracha! One of my kids’ favorite things for me to make is pretzels. I’ve made them a handful of times now, and while they’re not always the prettiest you’ve ever seen, they’re always pretty darn delicious. I wanted to try something a little different today, and decided to add crispy bacon, cheddar cheese and a touch of sriracha to the mix and see how it came out… Well, the results were exactly what I was hoping for, awesome! The combination of the bacon and sriracha gave the dough a great smokiness, but there isn’t enough sriracha to make it spicy. You can play with it if that’s what you want. If you make them, let me know how they came out for you! Ok so first things first, we have to crisp up the bacon. Heat 1tbsp of olive oil in a medium pot or sautee pan at medium-high and add your chopped bacon. Cook until crispy, use a slotted spoon to remove the bacon and set aside. Pour the rendered bacon fat into a cup or bowl and also set aside. In a small bowl or measuring cup combine your yeast, 1tsp of sugar and warm water. Let stand until the water becomes creamy and you get a nice bloom on the top. In a large mixing bowl combine your flour, 1/2c sugar and salt. Add your warm water with yeast and begin mixing. Once the flour starts to form a dough add your crispy bacon, shredded cheese, sriracha and bacon fat. Mix until a dough forms. The dough should be firm, but if it’s too dry add one or two teaspoons of water. Turn the dough out onto a lightly floured surface and knead for 7 to 8 minutes. The dough will be rough to work with at first and it’s going to take a bit of muscle, but it will loosen up as you continue kneading. Lightly oil a large bowl with 1tbsp of olive oil, place the dough in the bowl and turn to coat entirely with the oil. Cover with plastic wrap and a towel and set in a warm, draft free, place until the dough doubles in size, approximately 1 hour to 1 hour 15 minutes. I typically set my oven to 350F and place the bowl with my dough on the stovetop to promote rising, the stove gets warm but not hot. This may work for some people, for others it may not, it depends on your oven/stove. Heat your oven to 450F. In a medium sauce pot bring water to a simmer and add 1/2c of baking soda, allow to dissolve. Turn out your risen dough onto a lightly floured surface. You don’t have to knead it again, just lightly punch it down with your fingers to remove some of the air. Cut your dough into 12 equal parts. Roll each part into a rope and shape into a pretzel, pressing down where the pieces intersect. One at a time gently place your pretzels into the simmering water/baking soda and allow to cook for 30 seconds. Brush your pretzels with the melted butter and sprinkle lightly with the coarse sea salt. Bake the pretzels in the oven for 8-10 minutes, the tops should be lightly browned when done. Tags: bacon cheddar pretzels, homemade pretzels, sriracha. Bookmark the permalink.